At this time, we can ship to the United States, Australia, Canada, France, Germany, Ireland, Italy, Spain and the UK. We do plan to continue to expand this as soon as possible (yay!) but for now these are the only locations we can ship to! For guaranteed delivery by Christmas Eve, please see the following shipping deadlines! Your custom items may ship from more than one location. If so, a $5 fee will be added to your shipping total per location. Each May Designs product is perfectly crafted for you! Our products are printed on demand, and our notebooks are actually stitched with a sewing machine - so they require a little extra TLC! Your order should ship within 10 business days of your purchase date. 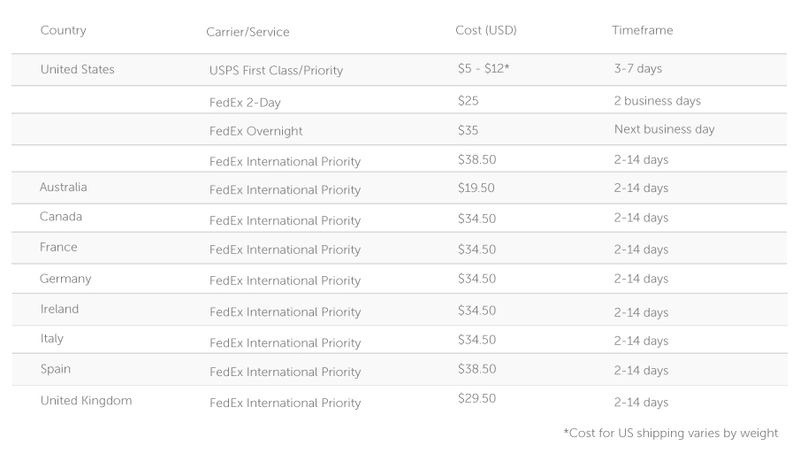 Delivery fees are charged for order processing, item selection, packaging, transport, and handling. Delivery times are not guaranteed, but are our best approximation, notwithstanding additional charges. Shipments and deliveries occur only on weekday business days (not on holidays or weekends). Orders received over the weekend will be processed the following business day. Delivery charges are subject to change. If you've already placed your order, but it has NOT been shipped yet, you are welcome to upgrade your shipping! Email orders@maydesigns.com and let us know. Online Orders: We accept Visa, MasterCard, American Express or Discover. May Designs is required by law to charge Texas state residents 8.25% sales tax on all products. Sales tax will be automatically added to orders shipped within the state of Texas. All orders shipped outside of Texas are not taxable.